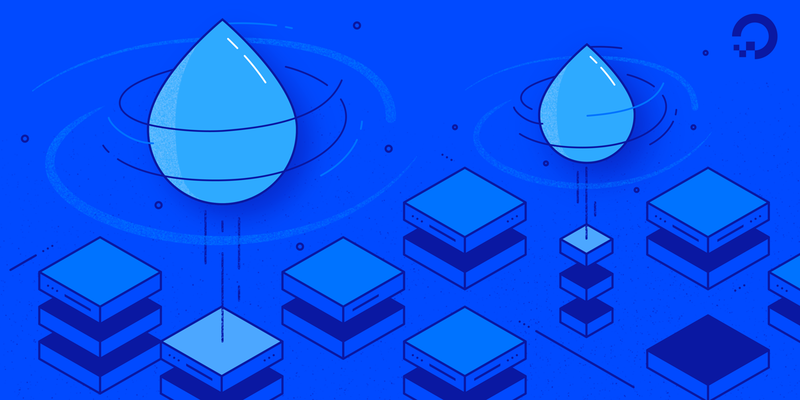 When DigitalOcean launched back in 2012, our first product – the Droplet – gave developers quick access to virtual machines running in DigitalOcean’s sole NYC-based data center. Unlike other cloud providers that charged north of $90 per month, we kept monthly costs as low as $5 by sharing CPU threads among customers. Fast forward to 2019, and millions of developers rely on DigitalOcean to learn best practices and run apps in twelve data centers across seven countries. As we’ve grown, developers and business customers have asked us to provide the same simple Droplet developer experience, but for VMs with dedicated compute power. That’s why we’re so pleased that – as of today – our new General Purpose Droplets, with a 4:1 ratio of RAM to dedicated CPU, are now Generally Available. Our new Droplets are live and ready to deploy in five of our global data centers: in New York, San Francisco, Amsterdam, Frankfurt, and Singapore. With our new General Purpose Droplets, you’ll be able to do more than ever before. General Purpose Droplets are backed by Intel Xeon Platinum 8168 "Skylake" Processors, which boast speeds of 2.7GHz. Because your vCPU has a dedicated physical CPU hardware thread, General Purpose Droplets guarantee uninterrupted high performance. Pricing is straightforward and highly competitive with our entry-level 8GB RAM/2 vCPU General Purpose Droplet costing $60 per month, or just $0.089 per hour. We ran a few micro-benchmarks to compare the performance of General Purpose Droplets with Standard Droplets (both instances have 8 vCPUs and 32 GB of RAM). The first case is Linpack, a high-performance computing benchmark that uses a large in-memory dataset to perform matrix multiplications. We ran the test 10 times, destroyed the instance, and recreated another one (which made the test run on a large number of different physical machines). 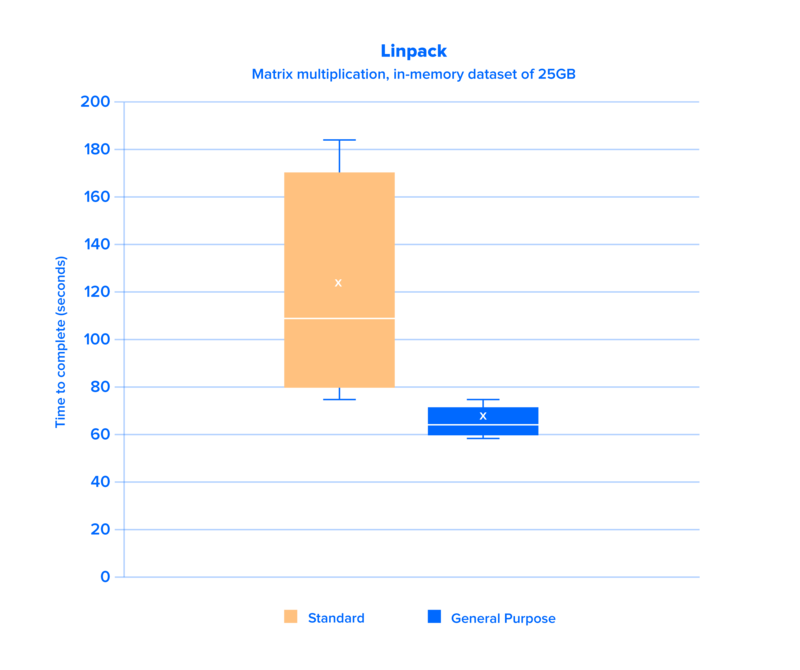 The box plot below shows the range – the minimum, first quartile, median, third quartile, and maximum time – that it took to complete each run. 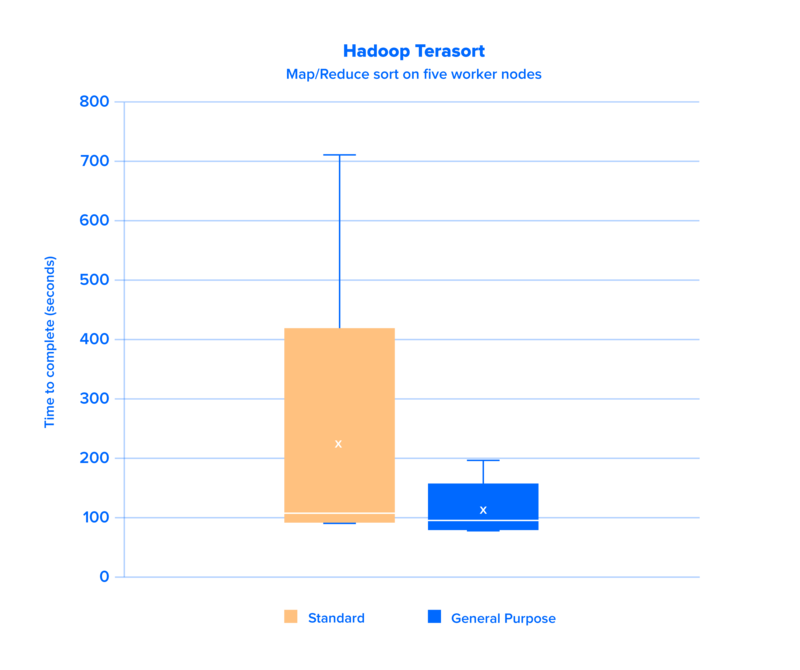 The second test case is the Terasort benchmark that uses Hadoop for map/reduce computations. In this configuration, we created one controller node and five worker nodes, all of which have to communicate to sort a large dataset. Similarly, we ran the test 10 times, then destroyed the instances, and recreated the same environment. In both cases, the General Purpose Droplets’ dedicated compute power resulted in substantially shorter completion times and a more consistent performance profile. This makes them ideal for high-performance applications that require fast, predictable results. Many developers and operators prefer to first deploy their applications on VMs that possess the balance of RAM and CPU provided by General Purpose Droplets. After deploying with General Purpose Droplets, you can migrate to a different type of Droplet after performance testing. If you find that your app needs consistent compute power, but does not quite need the memory that our General Purpose Droplets provide, then CPU-Optimized Droplets may be a better option. On the other hand, if your app’s CPU usage is bursty but still requires balanced RAM, less expensive Standard Droplets may be a suitable choice. But, for most production applications that demand consistent, fast performance for end users, General Purpose Droplets are probably your best bet. Your mileage may vary, but we typically recommend General Purpose Droplets for highly trafficked web and application servers, databases, ad servers, gaming servers, caching fleets, and other time-sensitive use cases. General Purpose Droplets are tightly integrated into DigitalOcean and automatically inherit many qualities and features intended to make you productive and happy. Arguably, what’s long set DigitalOcean apart from other cloud platforms is the developer experience. While other clouds may feel uninspired and complicated, our platform and General Purpose Droplets are fun and simple. Now – when you create a Droplet within our Control Panel – you can simply select “General Purpose” for your Droplet’s plan. Then, with a simple click of a big green button, you can spin up your General Purpose Droplets in 55 seconds or less. All Droplet types – General Purpose, Standard, and CPU Optimized – include features such as blazing-fast SSD storage, optional Backups and Snapshots, monitoring and alerts, network firewalls, and more. Some customers have already gotten started. Now you can, too. Prattle has been working to move our computational burden into a highly distributed, multi-cloud system to maximize availability and dependability. After creating our DigitalOcean account, we spun up hundreds of General Purpose Droplets, basically within minutes. It was almost shocking how easy it was to run thousands of cores against our production workload. Our experience with other vendors hasn’t been nearly as simple and straightforward. DigitalOcean's launch of General Purpose Droplets has led me to rethink just where we should be putting our resources." In the months and years ahead, we’ll continue investing in infrastructure, including additional Droplet types and capacity, so that you can build your applications and your business on DigitalOcean. Early-stage startups should also check out Hatch, our program that helps entrepreneurs launch and scale their businesses in the cloud through learning and sharing via an engaged community of founders, prioritized support, and a year of free infrastructure credits. We can’t wait to see what you do with General Purpose Droplets.